Every once and a while I get handed a book that changes my perspective on some of the ways I do things in my day to day life. 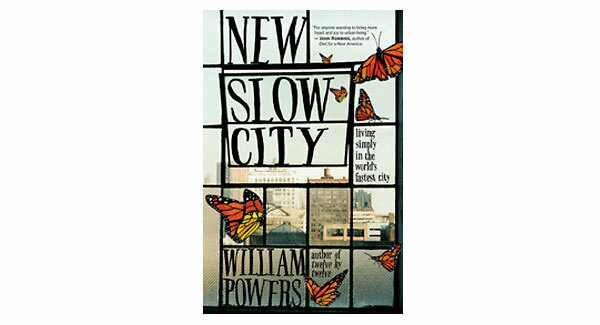 In New Slow City, William Powers changed my view on many different aspects, all specifically filed under a cohesive element: slow down. The book is written in first person, and follows Powers as he decides to take on the monumental challenge of slowing down in New York City in the midst of a crazy life. His writing style allows us to feel what he feels – his triumphs, his crushing defeats, his moral see-sawing and leaves us wondering where we actually stand. There were no definitive answers to the questions he posed in the book. There were suggestions as well as some things that Powers seemed to work out for himself, but the net result will not be the same for everyone, nor should it be. Powers crafted this book, in my opinion, to teach readers where to look for our own answers, following him on a wonderful and interesting journey as he undertook his seemingly impossible task. Twelve by Twelve left readers feeling that it was a great story with a lot of interesting turns, but that it wasn’t ultimately achievable to just drop everything and move to the countryside. From this sharp critique, New Slow City was born, leading Powers to attempt the same idea of slowing down, but within a bustling metropolis. As I said, it never seemed easy for Powers. The opportunity arose when his wife was promoted, but from there on, it was a roller coaster of very interesting emotions. One of the most amazing things about New Slow City is that Powers had no problem letting readers know where he got his information from, and never deemed to be a ‘mastermind’ behind it all. For example, He talks about several studies about the average work day, about a friend of his who pops in and out of the story who is working on GDH(Gross Domestic Happiness) instead of GDP. One item that truly stuck with me was the 80/20 study (which used the original Pareto Principle), which showed that during our workday we are running at 80% efficiency for only 20% of the day, and 20% efficiency for the remaining 80% of the day. The latter is based on another well known study from 1958 called Parkinson’s Law which demonstrated that people will fill their days as per the hours set (for instance, if I gave myself three hours to write an article, I would find myself clocking in at about three hours every time I finished one), so setting a shorter work day for yourself can lead to higher returns in happiness and in productivity. To put it simply, the law states that “work expands so as to fill the time available for its completion”. This is, perhaps, where the issue of applicability to the masses returns. For instead of packing our bags and moving to the country we now have a city as the background, but the underlying problem still exists: the readers life is not Powers’ life. I work a nine to five job, for example, while Powers is a writer/lecturer. When he does take on a teaching role later into his experiment, he basically sets his own hours and keeps them to a minimum. Very few of us have that ability or freedom, and it would be a grave error to at the book as a template for ones life. Powers surely would agree to this since he never professes the book’s content as being a strict template. Instead, one would be best served to pick up on the many little thoughtful seeds that Powers leaves for readers throughout the book. Furthermore, Powers’ excellent citations open the doors to many other learning opportunities. I found at least fifteen more books that I have on my “to read” list thanks to New Slow City, each of which has nuggets of wisdom. From ideas such as counting out your chewing (thirty times) before swallowing to truly savour your meal, to books on managing a stressful workday within the confines of our need for money to survive. The truth is, every chapter left me feeling like I had a new piece of information that I could try as a means of starting my own template for living slowly. I don’t know if I’d live in a micro-apartment like Powers did (roughly twelve by twelve like his previous foray), but understanding how to stop, breathe, and take life in, really struck a chord with me. Something as simple as looking up towards the “third floor” as he put it and refrain from looking at the ground to notice the many weird and wonderful things around you – above you – is surely a worthwhile endeavour for all of us. Fantastically written, New Slow City is a great book that gives readers a number of routes towards tailoring their own lives towards slowing down as a means of dealing with the constant pressure and stress we are under. The many elements I was able to take away from this book were invaluable, and is a testament to Powers’ ability to found a way live slowly even within in the World’s Fastest City. For more information, visit the New World Library website. Jeremy Senko is happily lost in the world of theoretical architecture and design. He is forever a student at heart, consistently reading, experiencing and learning about the world he inhabits. More specifically, he works as an Interior Designer in Vancouver and plays an active part in bettering the environments we live in. At least for once it doesn’t have the “get out of the city” template, which seems nice and pure individually, but when masses do it, it means sprawl and overuse of cars.